About an hour into today's ride, I remembered that I went on a century ride last year at Easter, too, with S, J, and K. We rode down to Brenham, in part to check out a shop that carried locally-produced goods, including local cheeses. I had messaged them in advance to confirm that they'd be open on Easter Sunday, explaining that we would be bicycling there from College Station (50 miles away) and upon receiving the affirmative, we all set out. They were closed when we arrived, and with his smartphone J confirmed that they had posted to say so just an hour earlier (so, after we had gotten well underway). Typical Texas. Fortunately, there was a fun-looking restaurant open in the town square, so we at least had a large lunch, and then a nice, scenic trip north. Today, I rode by myself. This was my second solo century of the year. The first one happened the day before MLK Day, somewhere between the time when S left town and when J and I rode one last Texas 200k brevet. Today's destination was simple - Nebraska City. Head out of Lincoln, hop onto the shoulder of Highway 2, go up and down a series of small hills, exit at Nebraska City. The shoulder was pretty smooth, and traffic was as nice as it could be on a highway (semi's changed lanes to go around me). Not a single foot of Texas-grade speed-sucker. Hallelujah. 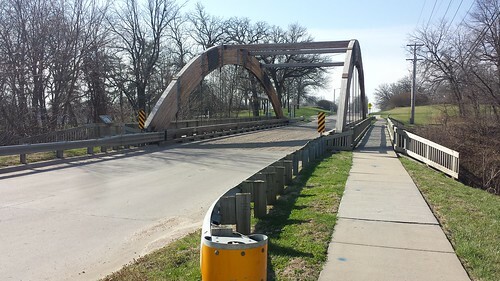 Nebraska City is the start and finish line for the Nebraska 200k and 300k. Since I don't own a car, I have to put some extra thought into methods for getting there. At the moment I am trying to pinch pennies until they squeak, to save up for other things, so I wanted to evaluate what it would be like to ride out there on a Friday evening, spend the night somewhere, get up and do the 200k brevet, then ride home. Bonus miles. And a chance to see what the town is like. The other option would be to rent a car Friday night, drive out Saturday, ride, drive back and turn in keys. Probably more expensive than riding and sleeping somewhere, with the added cost of insurance. and stop at the Shell station downtown for some Fritos (the local gas station and store were closed for Easter). Nebraska City looks like it has some beautiful parks. In the spring, the winds in Nebraska largely come out of the south-southwest, increasing in power over the course of the day. 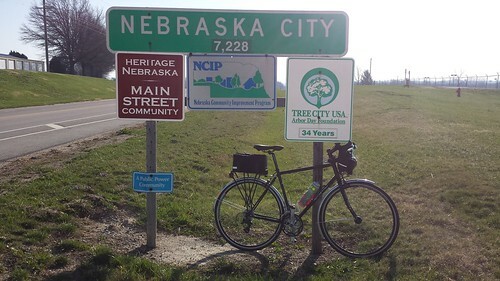 I made it to Nebraska City in three hours and twenty minutes, mostly with a cross-tailwind, but had some sections with strong winds on the way back. Nothing insurmountable, just...draining. Good brevet training, I figure. So I decided that, instead of going back the way I came, about 20 miles from Lincoln I would detour north towards Eagle, the destination of the Tuesday Nacho Rides (haven't been to any of these yet, might not ever get to go, depending on work and how many bike friends I do or don't make). The northward stretch towards Eagle gave me a relief with 8 miles of tailwinds, then just a bit of headwind for the rest of the ride into town. I had this song stuck in my head for part of the ride, except I couldn't remember the lyrics correctly (kept thinking "When you're walking in the street," which gave the song more complexity and meaning than it actually has). When I got home, I put my feet up for about five minutes, then took a shower, changed, and went to the lab to work on urgent cricket chores for a couple of hours. I had to start the century ride at 6 am to ensure I had enough time for the cricket chores. They sucked, as I knew they would, because I was very tired. Then home, for a simple dinner, and soon, bed. Woo hoo second century of the year! You're way ahead of me. That sounds like a lovely ride. I just realized that if we both did 400k rides, we could meet in North Platte. You know, the Bike Ride Across Nebraska, in June, starts in Wauneta, which isn't all that far from North Platte. Not that I can afford the time off for the ride. Every time I open one of my colorado atlases I find a sticky note saying 'stop delaying and ride here already' on various pages. I put them there probably fifteen years ago and still haven't ridden there. This is another point where thewronghands has an insightful contribution - if you turn those places into shared events, you're more likely to get out there and visit them. But there are only so many hours in the day, and days in the week, after all. Hi, I was poking over here from thewronghands' journal. I was skimming down and saw the picture of the bridge and said Hey! I know that bridge! I've been to Nebraska City and Lied Lodge about five times. The last time was just under two months ago. It's really pretty around there in the fall--I was there last October and the leaves were just starting to turn and it's really nice. The area behind the Lodge and up into the Arbor Day Farm is pretty even when the leaves aren't out yet. There is an interesting park up there I've gone running around too. How do you like Lincoln? I've spent much more time in Omaha (I have contracts with the Corps of Engineers to do ecological modeling among other things) but have spent some time in Lincoln too. I have a colleague/friend in the School of Natural Resources at UNL. Regardless - it's good to hear that Lied Lodge should be a good place to visit in the fall. I enjoyed my extremely brief tour, so I'll make a mental note to think about going back in the fall for a more touristy visit. I *really* like Lincoln. I've been pleasantly surprised by just how much I like it. I think that's because it's large enough to have a solid collection of interesting cultural amenities, but the cost of living is reasonable, and it's also still easy to escape from the confines of the city and go on adventures. Plus, lots of people ride bikes here, and the trail system is great. I haven't made it over to Omaha at all yet, since I don't have a car or any specific reasons to go over in that direction, but I've started to accumulate a list of interesting destinations to check out there, too. I do not know gfrancie. I added you, by the way, as my journal is just about exclusively friends-locked since I started my current job. Have you been to Nine Mile Prairie? Hmm, I'll add you back! I haven't been to Nine Mile Prairie...but I'll add it to the list of places to check out!